I think I’ve been lying to myself for years and years. For as long as I can remember, I have had fish issues – or “fissues” as I like to call them. I hate open water. I hate being on a beach. Even sitting on the sand makes me nervous. I don’t like critters that live in lakes and oceans, and I don’t want to be anywhere near them. I don’t want to swim with them. I don’t want to look at them. I don’t want to eat them. I want absolutely nothing to do with them. In fact, I don’t even like fish tanks. They creep me out. I do race occasionally in open water, but I only get in open water when I have to, and I make sure there are a few thousand other people in the water with me to scare all the evil away. I have even long joked with my friends that, if ever I tell them I’m going scuba diving, they should know that there is a man involved, and it is serious because never in a million years would I voluntarily subject myself to exploring the deep waters in search of “beautiful” ocean creatures. No way. No how. Never. For years, I’ve said that my fear of fish goes back to the third grade when my elementary school class in Corpus Christi, Texas, took a trip to the beach and a big chunk of our class was taken down by a huge wave. (Or is the proper term tide? I don’t know. It was a bunch of water that unexpectedly rushed the beach where we were walking.) I was one of the kids swept up by the water, and it terrified me. My feet came out from under me. Suddenly I was jostling around, and I didn’t understand what was happening to me. I didn’t know which way was up. I couldn’t breathe. I didn’t know how it would end. I was just scared. And later, when I was safely back at home, I stripped out of my clothes and saw and felt sand and what looked to me like random bugs and critters all over my clothes and body. I remember peeling gross, living things off my stomach. The whole experience ruined open water for me. Or so I’ve been telling myself. 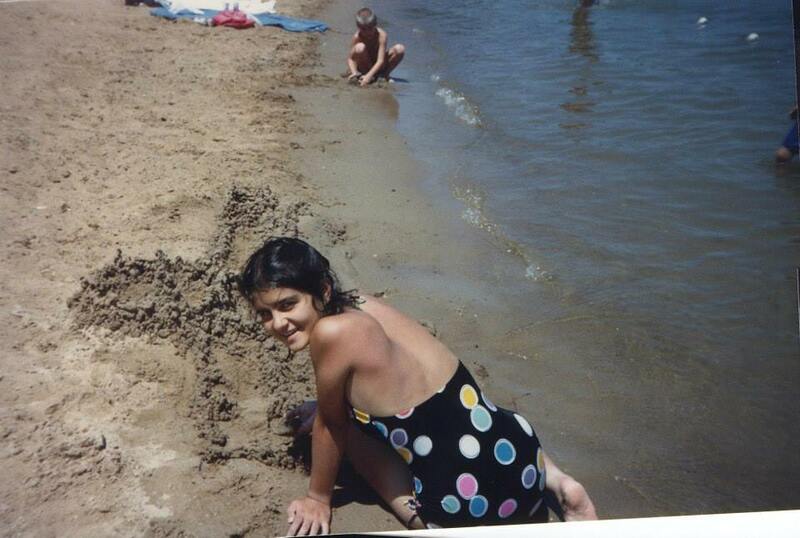 This picture was taken in the summer of 1987. I was thirteen at the time. Looking at the picture, I see that I was not a thirteen-year-old kid who hated open water. I was a kid who clearly had been in the water and was happily sitting where the water meets the sand making a sandcastle. If I hadn’t seen the picture – if Emily had just said to me, “Hey, do you remember when we were at camp and we went to the lake and made sandcastles and swam,” I would have been certain she had me confused with someone else because for years and years I have been telling myself that I have been terrified of open water since I was eight years old. But the picture tells an undeniably different story. This picture of a happy me at a lake forces me to ask some questions. If my explanation for my fissues is not that I had a bad experience in the third grade and have hated open water since, then what is my explanation? What is the truth? Is there an explanation or did I just look into my past in search of some rationalization for my fear and decide that the incident from third grade was the likely culprit? I now have no idea why I’m afraid of fish. I know now that the story I’ve been telling myself about why I hate open water is not true. It is true in that the event happened, but that event did not cause the fear I carry. At the Storyline conference this weekend, we talked about the stories we tell ourselves that might not be true. Shauna Niequest, a writer whose work I was introduced to at the conference, asked us some questions. Are we holding on to old stories? Are we holding on to false stories about ourselves or stories we picked up from other people along the way? I wonder what other stories I’ve been telling myself that aren’t true. For years, I told myself that I hated speaking in front of people, but I discovered through Toastmasters that I love being in front of an audience when I get to choose the topic. For years, I told myself that I have good endurance but no speed, but through training with TriDot, I’ve discovered that I am faster than I thought I could be. For years, I’ve told myself that I’m not creative enough to write for a living. Is that true, or have I just talked myself into being afraid to try? For years, I’ve told myself that I’m not lovable for the long haul. Is that true, or have I just not yet met the person who will stick with me through everything? The exciting thing we talked about at the conference was that it’s possible to write new stories for our lives. I want to do that in more ways than one, and my fissues seem to be a good place to start. I want to be a person who can swim in a lake or ocean and sit on the beach with no fear of critters. Apparently, I’ve been that person before. How do I become that person again? Do I start some fish tank therapy where I force myself to sit in front of fish and discover their beauty? Do I start accepting my coach’s invitations to do open water swims with just a few other people? Do I try my hand at snorkeling or scuba diving – for me, not for some man? I’m not sure yet, but I intend to figure it out. I’m working on a story about a girl who developed fissues somewhere along the way but then figured out a way to overcome them and now, once again, comfortably sits on the beach making sandcastles and smiling. That’s a story I look forward to telling. This entry was posted in goal-setting, Hope, Intentionality, New beginnings, Progress. Bookmark the permalink. Thank you. I appreciate the feedback and hope you found it useful in some way. Amit, Thank you for your ongoing support. I appreciate you so much.